Lampkin and Susie Butts witness pediatric expansion construction for Children's of Mississippi. Media Contact: Annie Oeth at 601-984-1122 or aoeth@umc.edu. Children do tend to leave fingerprints here and there. After raising three children and now welcoming five grandchildren as regular guests, Sanderson Farms Chief Operating Officer Lampkin Butts and wife Susie were accustomed to wiping away sticky fingerprints and admiring finger paintings. After visiting Batson Children’s Hospital each year as part of activities related to the Sanderson Farms Championship “the children there left their fingerprints on our hearts,” Susie Butts said. 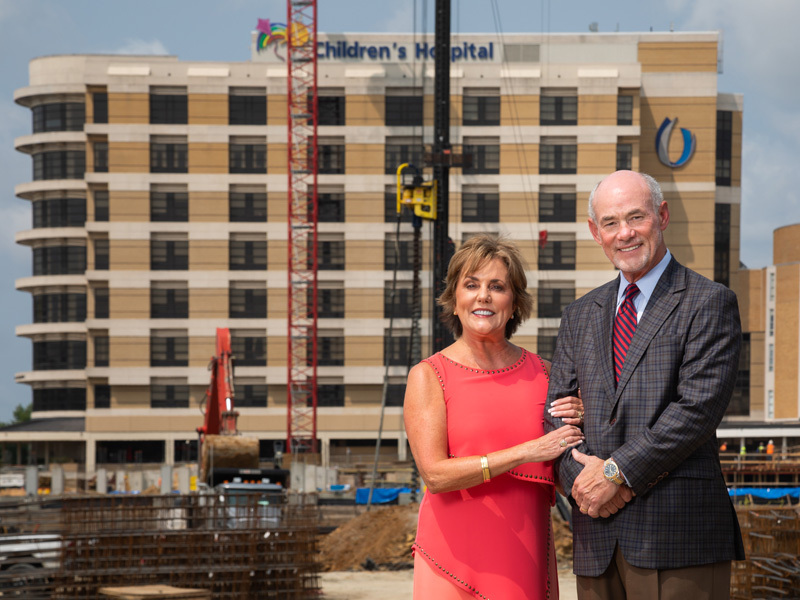 After learning more about the mission of the state’s only children’s hospital, the couple made a $1 million donation to the Campaign for Children’s of Mississippi, the philanthropic drive to help pay for expansion of the University of Mississippi Medical Center's pediatric facilities now under construction adjacent to the Batson Tower. Dr. Mary Taylor, Suzan B. Thames Chair, professor and chair of pediatrics, thanked the family for their gift. The new, $180 million, seven-story tower currently under construction will include 88 private neonatal intensive care rooms, 10 surgical suites, additional space for pediatric intensive care and an imaging center designed for children. A pediatric outpatient clinic will feature specialties including neurology, cardiology, pulmonology, urology, gastroenterology, orthopaedic care and more, in one location. 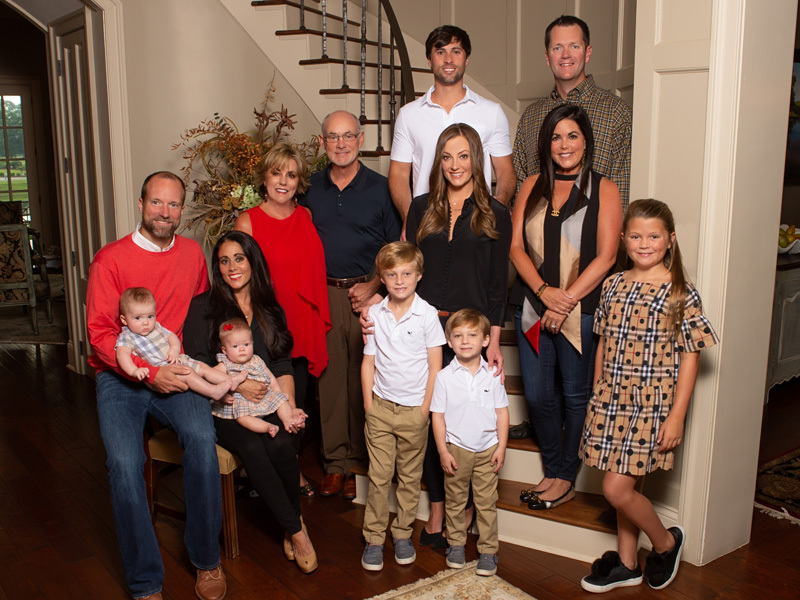 The Butts family includes, front row from left, Benton Felder, Stella Felder, Case Butts, Brooks Butts and Sadie Sutton; second row from left, Jeremy Felder, Stephanie Felder, Susie Butts, Lampkin Butts, Lauren Butts and Christie Sutton; and third row from left, Casey Butts and Trey Sutton. The contributions Sanderson Farms has made to the hospital through the Championship, Mississippi’s only PGA TOUR event, have been gratifying, said Lampkin. “It is great to see this project underway and to know that Sanderson Farms and Joe and Kathy (Sanderson) have had a part in making this happen. Since Century Club Charities, host of the Sanderson Farms Championship, announced Sanderson Farms as the tournament’s title sponsor in 2013, more than $5.5 million raised through the event has been donated to Friends of Children’s Hospital, a nonprofit group that raises funds for the state’s only children’s hospital. This is the fourth consecutive year Century Club Charities has donated more than $1 million to Friends, which has made a $20 million pledge to the campaign. The 2017 tournament resulted in a donation of $1.2 million. The 2018 Sanderson Farms Championship is set for Oct. 22-28 at the Country Club of Jackson. Sanderson Farms CEO and board chairman Joe Sanderson Jr. and wife Kathy helped launch the Campaign for Children’s of Mississippi in 2016 with a personal donation of $10 million and their commitment to chair the effort. Since then, the drive has raised more than $66 million toward its goal of $100 million. Joe Sanderson said the gift from the Lampkin and Susie Butts was a surprise to him and Kathy. Sanderson first met Lampkin when they were children attending First Presbyterian Church in Laurel. “When Lampkin graduated from the University of Mississippi, we recruited him to Sanderson Farms in sales, where I was, back in 1973,” Sanderson said. The two have worked together ever since.